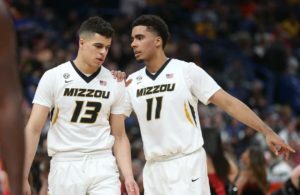 Mizzou sophomore forward Jontay Porter suffered a season-ending knee injury during a closed scrimmage vs. Southern Illinois on Sunday. Porter tore his ACL and MCL in his right knee while driving to the basket. The 6-foot-11 Porter averaged 9.9 points and 6.8 rebounds as a 17-year-old freshman. Just last week, the former five-star recruit was named a preseason second-team All-SEC selection. Porter tweeted on Sunday night. Thanks to everyone who reached out! It’s hard to stay positive in the midst of something like this but everything happens for a reason.